Note that a Kerberos Server manages one Realm only, a Realm can be managed by more than one Kerberos server : this is mandatory to avoid a single point of failure, if a Kerberos server halts for any reason. In order to distinguish the Realms, we give them a unique name. 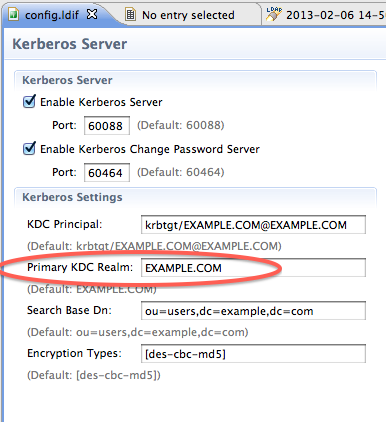 This name can be anything, but a convention is to use the DNS name of the Kerberos server, and to use uppercase. For instance, say that th Kerberos server is installed on a machine whose domain name is apache.org, then we will use APACHE.ORG as the Realm name (but you could use Apache.org or even MyApacheDomain). Note that the name is case sensitive. **apache.org** is a different realm than **APACHE.ORG**.